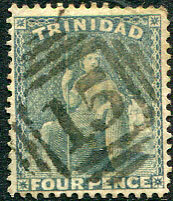 (Type 0.4) on 1876 4d bluish grey CC wmk P.14 (SG.76). (0.4, long-tailed) on 1876 (1d) lake (SG.75). (Type 0.2) on top marginal 1859 (1d) rose-red Pin-perf. 13½-14 (SG.38), unusual to get an intact row of pin perforations. (Type 0.9) inverted A/JA 16 98 cds portion of numeral duplex on 1d Britannia (SG.115), seldom offered. 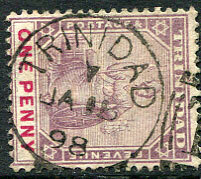 (Type 0.9) A/DE 8 03 cds portion of numeral duplex on ½d Britannia (SG.127), seldom offered. (Type 0.9) A/JY 5 02 cds portion of numeral duplex on 1d Britannia (SG.128), seldom offered. (Type 0.9) A/JA 1 02 cds portion of numeral duplex on 1d Britannia (SG.116), unusual positioning of year "02" in larger font. Seldom offered. (Type 0.2) on (1d) rose-carmine (SG.75b), surface ink smudge. (Type 0.9) on 1d (SG.101), minor thins. 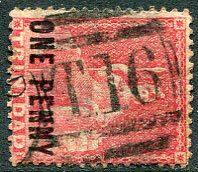 (Type 0.2) on 1855 (1d) brick-red (SG.8), clear margins. (Type 0.9) on 1876 (1d)rose-carmine (SG.75b), rarely found on this issue. 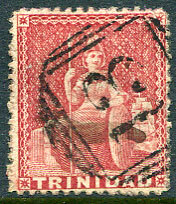 (Type 0.9) dated C/JU 22 82 on (1d) rosy carmine (SG.101), badly defective at base. (Type 0.2) on 1863 4d dull lilac CC wmk (SG.70b), trimmed perfs. at right. (0.7, large) part dated 23/-U 30 1880 on 4d bluish grey CC wmk (SG.76), horiz. crease. 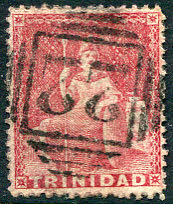 (Type 0.9) on 1882 1d rosy carmine (SG.101). 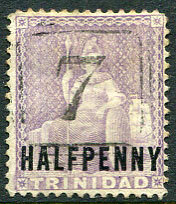 (Type 0.2) on 1863-80 1/- mauve (aniline) (SG.73b), some trimmed top perfs. (Type 0.2) on 1863 4d pale mauve CC wmk (SG.70a), perf. faults. (Type 0.2) on 1857 (1d) rose-red/white (SG.12, Cat.£70), margins just clear or touching. (Type 0.9) on QV 1d (SG.107), blunt perf. etc. (Type 0.4) on 1863-80 (1d) carmine P.12½ (SG.69d). 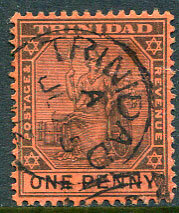 (T.04) on 1922 KGV 1d (SG.219). (Type 0.9) on QV 4d (SG.110). (Type 0.9) on QV 2½d (SG.108). (Type 0.6) re-allocated use on 1901-06 1d (SG.128). (Type 0.9) on QV 1d (SG.107). (Type 0.2) on 6d (SG.77a), thinned with perf. fault. (Type 0.9) on 1d (SG.75c). 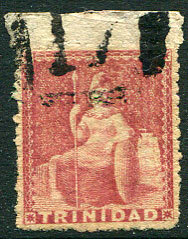 (Type 0.9) on REVERSED CA wmk 1d (SG.101x). (Type 0.4, horiz, serif) on 1d (SG.75c). (Type 0.6) on QV 1d (SG.107). (Type 0.6) on ½d (SG.98x). 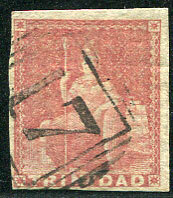 (Type 0.3) on 1d (SG.53, Cat.£32), trace of ironed crease. (Type 0.6) on 1d Britannia (SG.134). (Type 0.9) on 1d (SG.101). (Type 0.9) full duplex dated reversed C/MR 31 86 on QV ½d Newswrapper cut-out piece. (Type 0.2) on 1853 (1d) brownish red/blued paper (SG.7, Cat.£70), clear margins. (Type 0.2) on 1876 6d bright yellow-green CC wmk P.14 (SG.77). (Type 0.9) on QV ½d (SG.106). (Type 0.2) on 1/-mauve CC wmk P.12½ (SG.73b). (Type 0.2) on 6d apple-green (SG.72c), some toning. (Type 0.7, small) dated 23/FE 22 1873 on Crown CC INVERTED & REVERSED wmk 1d scarlet P.12½ (SG.69y, Cat.£70). 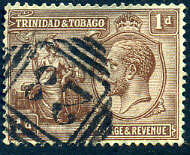 on 1863-76 1/- mauve (aniline) CC wmk (SG.73b). on 1876 1d lake CC wmk P.14 (SG.75). 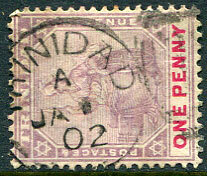 on 1863-76 4d dull lilac CC wmk (SG.70b). 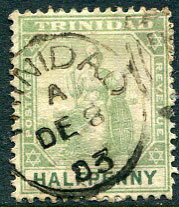 (Type 0.4) on 1863 6d yellow-green P.12½ (SG.72b). (Type 0.2) on 1872 4d grey CC wmk P.12 (SG.71). (Type 0.9) on 1876 (1d) rose-carmine CC wmk P.14 (SG.75b), thinning in several places.